Let's set it straight and set it straight early. This is hypocracy and lunacy. Alaskan blogger Linda Kellen (Celtic Diva) is looking to raise over $5,000 of other people's money to determine if Alaska Governor Sarah Palin was involved in a smear campaign conducted against ethics violation filer Andrea McLeod. How is she doing this? By smearing Palin with an abusive picture mocking her special needs son, Trig. 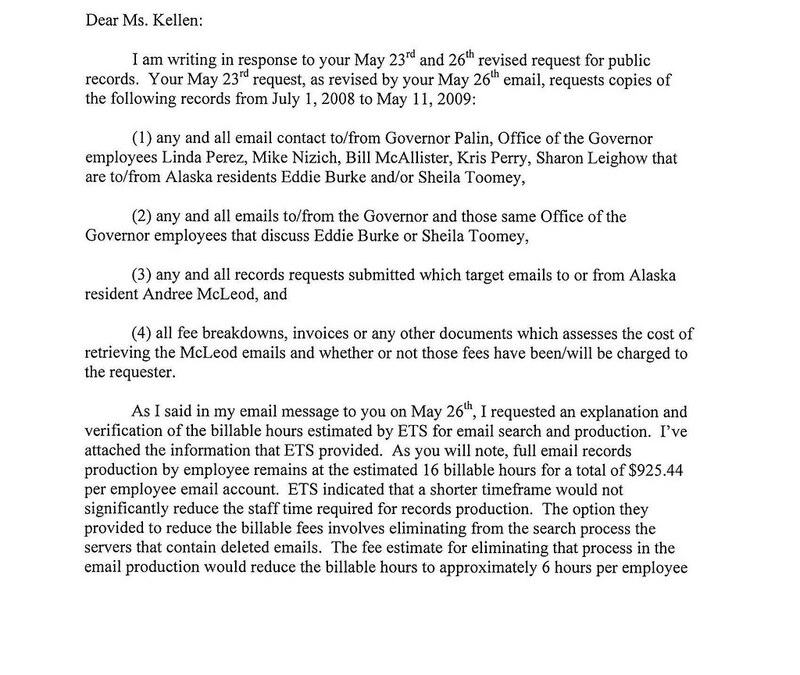 Kellen is going to try to accuse Governor Palin of an ethics violation by questioning the connection of information legally provided by the Governor's office to Eddie Burke (KBYR talk show host) and Sheila Toomey (Alaska Ear gossip columnist) as part of a smear campaign against McLeod on radio and in blog. In doing so, she mocks Trig Palin (see the abusive picture on Conservatives4Palin) and the Conservatives4Palin fundraising effort for the Alaska Trust Fund, Sarah Palin's legal defense fund in her own effort to raise funds to pay the costs of obtaining emails between Palin, Burke and Toomey. It's a smear campaign designed to accuse the smeared of being a smearer. Conservatives4Palin calls it "Disgusting." They say Celtic Diva "should be ashamed of" herself before asking the money question: "Is this the position of the Alaska Democratic party?" Politically aware people know that Linda Kellen (Celtic Diva) by the nature of her being a Democratic political operative during the 2008 presidential campaign was heavily involved in a major smear campaign herself against vice presidential candidate Sarah Palin. Andy Martin says Obama is responsible for anti-Palin smears. He says "smears are an integral part of any Barack Obama/David Axelrod operation." Martin wrote "Obama controls a sophisticated network of left-wing bloggers (emphasis added) and mainstream media dupes." As soon as the buzz hit after Sarah Palin's convention speech, Democrat operatives went to work devising ways to undermine Palin's candidacy. On September 8, 2008, FactCheck.org noticed an unusual amount of internet traffic smearing Sarah Palin. Eric Erickson at Human Events pointed his finger specifically at David Axelrod when he wrote that "When those grassroots attacks are manufactured by public relations firms, they aren’t real: they’re astroturfed -- fake attacks designed to look like a grassroots movement." I find it hard to believe Ms. Kellen stayed home to work in her garden that day since she was the official Alaska blogger for the DNC (Sam Kinison raised voice at the end for emphasis). Palin's poll numbers were high the day the smear campaign went full tilt, which discounts the possibility of an unhappy electorate coming out en masse to protest Palin's selection as VP candidate. When she had just pushed the McCain campaign into a tie with Obama, the Obama campaign and its surrogates manufactured a false impression that there was a popular outcry against Palin. The rumors went as far as to be picked up by the mainstream media and would eventually be used to create a false impression that Mrs. Palin "was not ready for prime time." Celtic Diva continues to smear Sarah Palin on her blog in a coordinated effort with the likes of Shannyn Moore and AKMuckracker, left wing hacks who "reported" on Governor Palin's speech introducing Michael Reagan in Anchorage on June 6, 2009. Shannyn Moore and AKMuckraker attended the speech and also had an affiliate in New York who saw the Sean Hannity interview on June 8, 2009. Both events are described on AKMuckraker's blog The Mudflats. Moore's Palin Derangement Syndrome is evident in the large number of anti-Palin articles on her Huffington Post blog. Eddie Burke (KBYR talk show host) and Sheila Toomey (Alaska Ear gossip columnist) both seemed to be participating in a coordinated smear campaign of citizen watchdog Andree McLeod. Both received inside information from the Administration that they discussed in their respective mediums. Both made claims that they were receiving/had received documents from requesting records of the State. Knowing how it works and knowing the timing required, that seemed highly unlikely if not impossible. So, I did my own records request(s) looking to see what kind of communication between the Palin Administration and these media figures was actually going on. The initial price tag--$65,000! 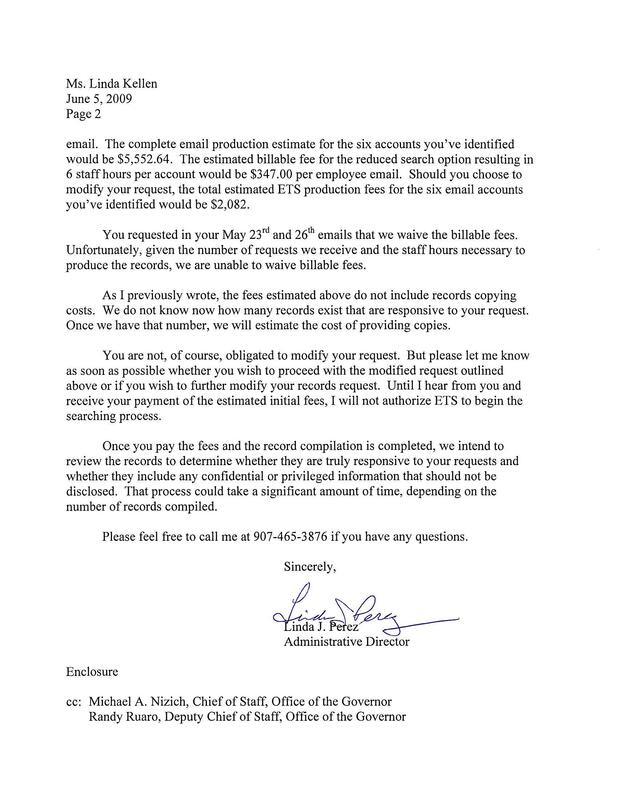 I replied to Linda Perez, Administrative Director of the Department of Administration, combining the records requests into one and limiting the scope. I also asked for an explanation of the search process that was taking 16 hours per employee. To think that Ms. Kellen is going to craft together some far stretching story about a coordinated smear campaign being conducted from the Governor's office is preposterous. Eddie Burke and Sheila Toomey obtained the documents legally and used them to go after an ankle biter. Good for them. Isn't that the game Kellen and her cohorts have been playing against Governor Palin since day one? Fair minded Americans of all political persuasions should have no problem with Palin supporters dragging the likes of McLeod, Celtic Diva and her cohorts through the mud because they deserve it. Those who live by the sword of smear shall die by the sword of smear. The political reality is that the Democrat party won the 2008 election using their rules, the smear rules and the Alinsky rules. Elections have consequences. They own the board now. Conservatives, who normally don't like to get their hands dirty, have found that there is no longer a choice in the matter. They have to play now. 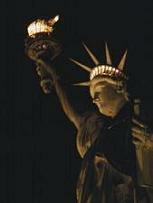 The deterioration in the polls for George W. Bush was due highly in part to his unwillingess to fight back. Having recognized that, conservatives are now prepared to take the Democrat smear machine head on and defeat it at its own game. So Celtic Diva, the official Democrat smear merchant of the 2008 presidential campaign, is going to spend other people's money to determine if Governor Palin is a smear merchant. That's pretty friggin funny if you ask me. Patrick S. Adams is a freelance blogger. The same picture was on Crooks And Liars with Letterman's face on the baby, no one cared then, must be just because its Linda and C4P'ers hate Linda. Looks like they've got damage control out and about, Patrick. fwiw, you are a trig truther. A true POS. Saw your posts at c4p and your a real piece of work. Go straight to hell. You defend Letterman and Dr. Chill/celticdiva because you are deranged. Bet you would not "laugh" at a pic of Obama's daughters being used to "make a point". Seems to me that your morals are f-up. True liberal scum.